Welcome back to Crock pot Thursdays by Andersons Angels and Staying Me. This is a blog hop for and about delicious Crock Pot Recipes! We are hoping that this hop will help all you busy moms with getting yummy dinners on the table for your families without having to spend a ton of time in the kitchen. 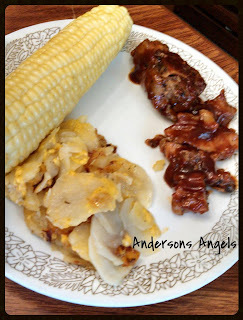 This week I am sharing with you my recipe for BBQ Ribs. This would be SUCH hit in our house! Everybody would be more than willing to live off of ribs forever. :) Saving this to try out later! Oh yum! I've actually been wanting to make ribs in the crock pot lately so I'll have to try this recipe. We love Sweet Baby Rays too. That looks like such a scrumptious dinner! We're big fans of everything on that plate! I'll need to try that recipe!